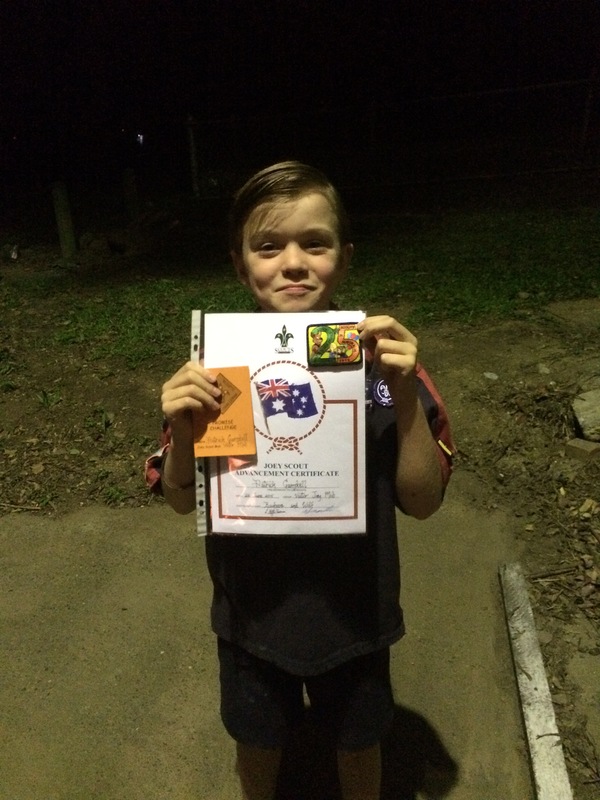 Advancements, Anzac Day, Moon Walking and Star Wars. Who wouldn’t want to be a Victor Joey? Wow, what amazing achievement for our mob. 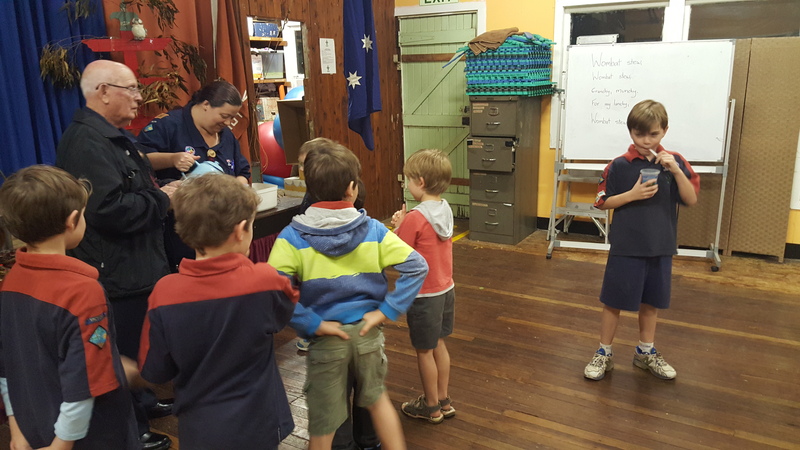 With lots of hard work, nights visiting cubs and working on their individual Promise Challenge projects, 4 of the mob advanced into the cub pack. 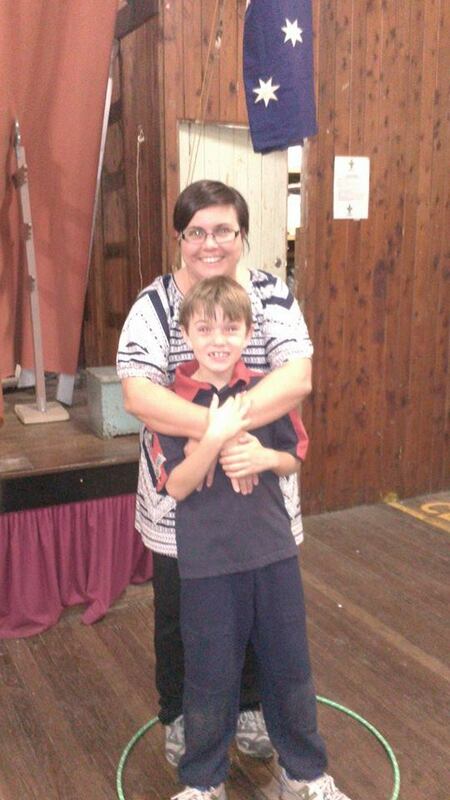 There were 2 very proud Joey leaders and some even prouder joeys! 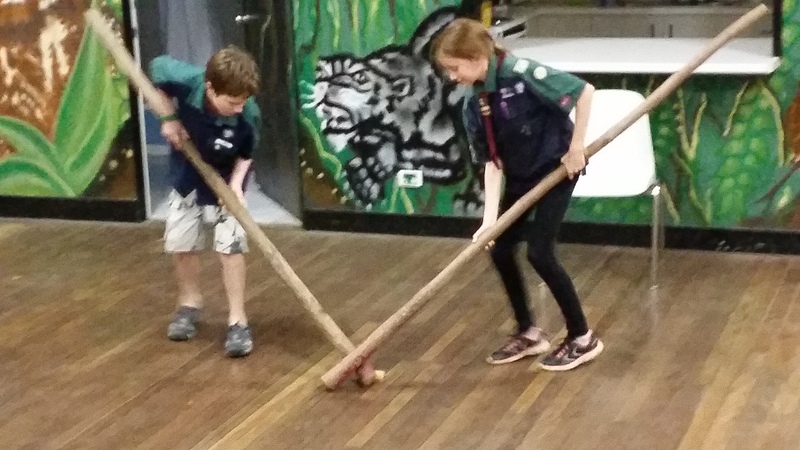 The mob took part in a Gross Fun Advancement night – armpit fudge, apple bobbing, a campfire filled with all of the 4 joeys favourite songs ( 20 000 feet, 3 chocolate éclairs, Hello my name is Joe) led on to Hawkeye taking them away to join the cub pack. 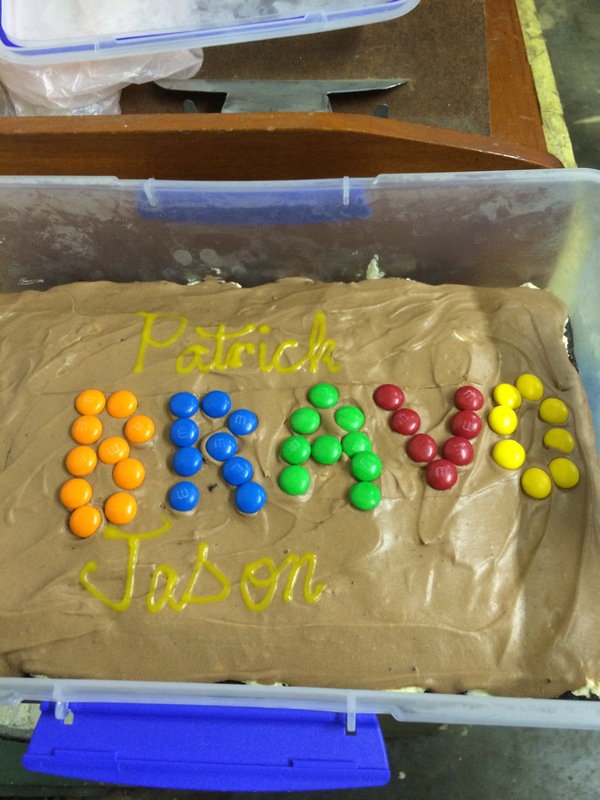 A very special supper and cake ended the very last Joey night for Oliver, Max, Jack and Travis. 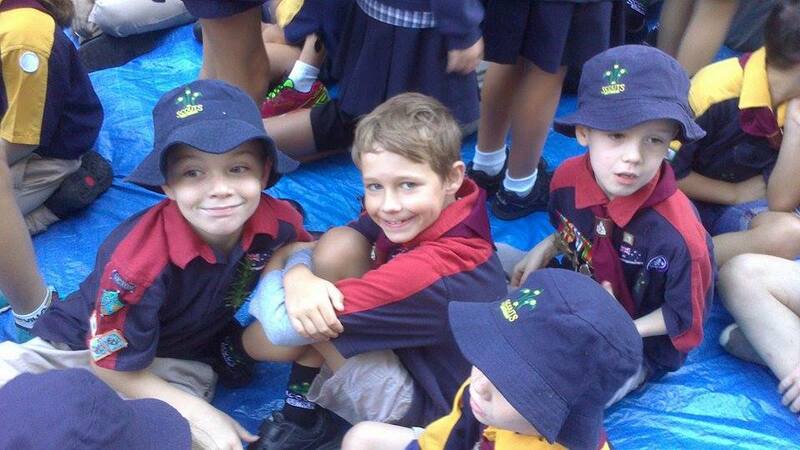 Well done to you all and best wishes in the cub pack. The mob joined the rest of group for the Anzac Day March and Service. Ben and Adam were given the honour of laying the wreath for the Joey section during the service. They both did a brilliant job and respected the solemnity of the day. On the Tuesday, we continued learning more about the Anzacs and their service by reading a book about the landing at Gallipoli, hearing about why Australia was involved and partaking in activities that reinforced what we had learnt. The mob then made damper. What happens when our mothers come along to Joeys for Mothers night? 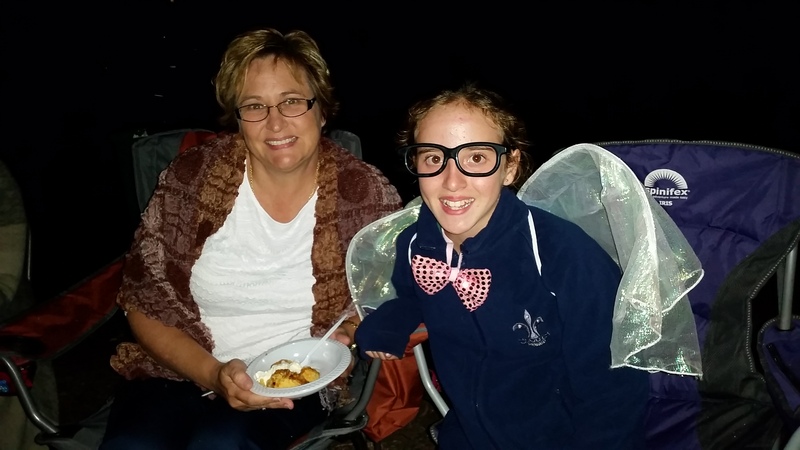 They become honorary Joeys for the night and take part in ALL of the activities! And that is exactly what our intrepid and brave mothers did. 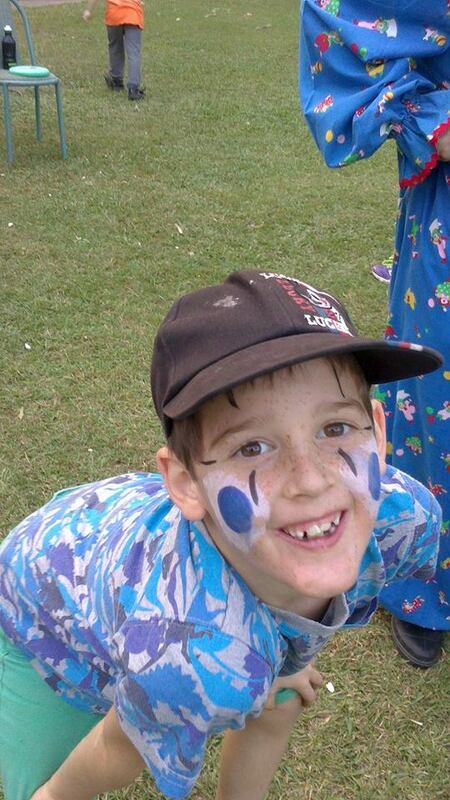 Brainteaser questions, Bandelogs tails and shark island, clown dress ups for the malteser game and Hug-a-tree were all gamely played by the mothers before the joeys allowed them to have supper. Luckily, the mob had made their mothers a lovely gift to show how much they care about them all – Fairy jars. Visiting some of our favourite Australian children’s books is always an excuse for a mob ight of costumes, drama and laughter. This term we chose ‘Hairy Charlie and the Pumpkin’ by Dawn French. The mob stuffed scarecrows, made Hairy Charlie beards to wear and then were entertained by Bagheera playing Hairy Charlie dealing with a very fast growing pumpkin vine AND chasing away a very pesky magpie played by Wolf. The Joeys thought they were hilarious! 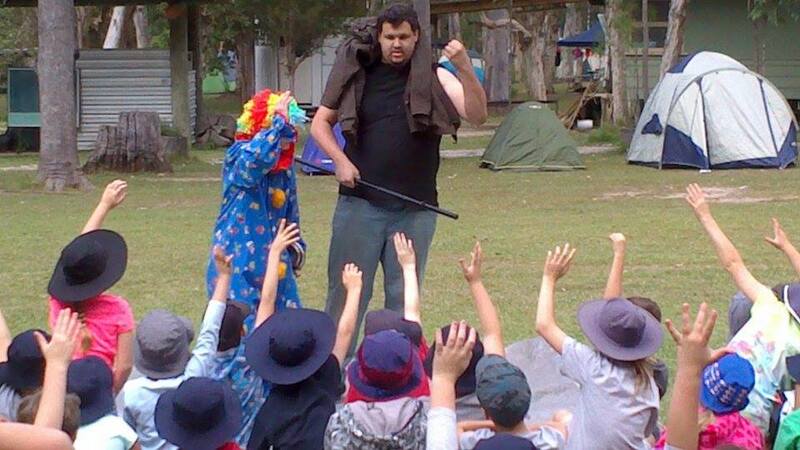 and culminated in them graduating from the Joey Jedi Training School. Spirit of Anzac Centenary Exhibition. 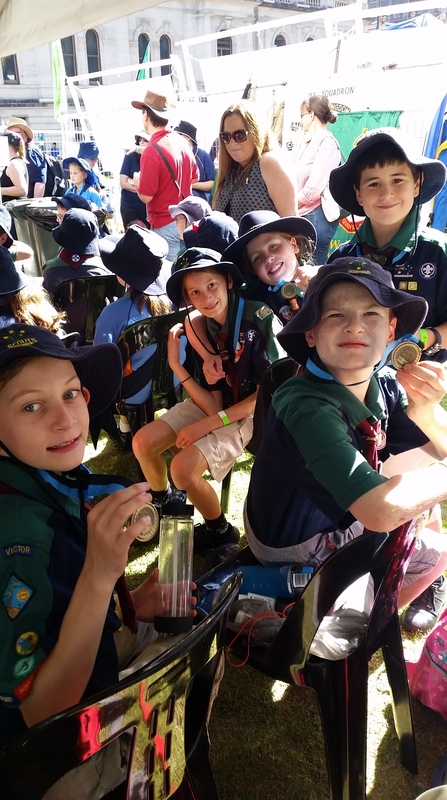 The joey mob attended a very special exhibition called “Spirit of Anzac Centenary Experience’ with the scout section from Victor and with our mob buddies from Upper Mt Gravatt plus the cub pack from UMG. It was an audio guided exhibition that took us through World War One from the beginnings of the start of the war, through the increasing involvement of the Anzac troops, examining the various battles and armaments before reaching the conclusion with Armistice Day and commemorating those service men and women who were lost. The joeys were so respectful and learned a lot from the exhibition and we were very proud of them. Many of the families visited the exhibition a second time as it was so thought provoking. Tonight was very exciting. 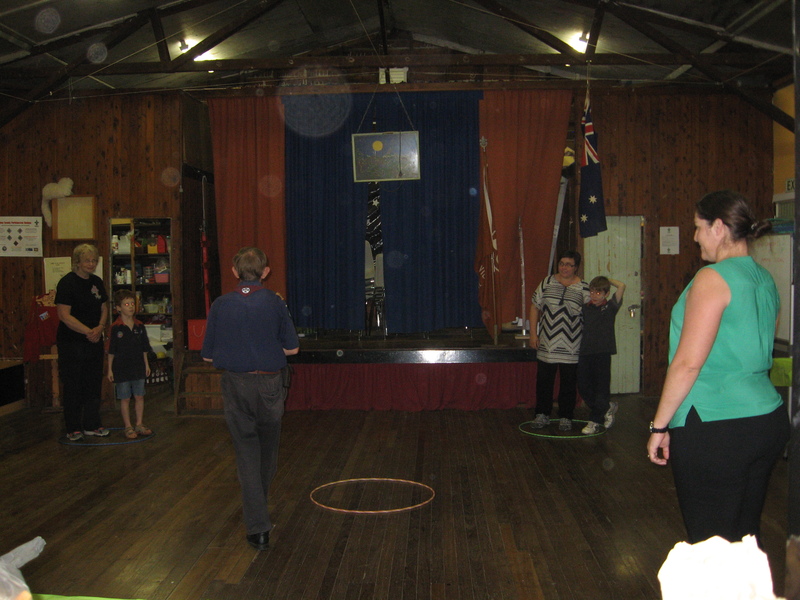 We headed down to the Holland Park RSL to make sure it was clean and tidy and ready for ANZAC Day service. 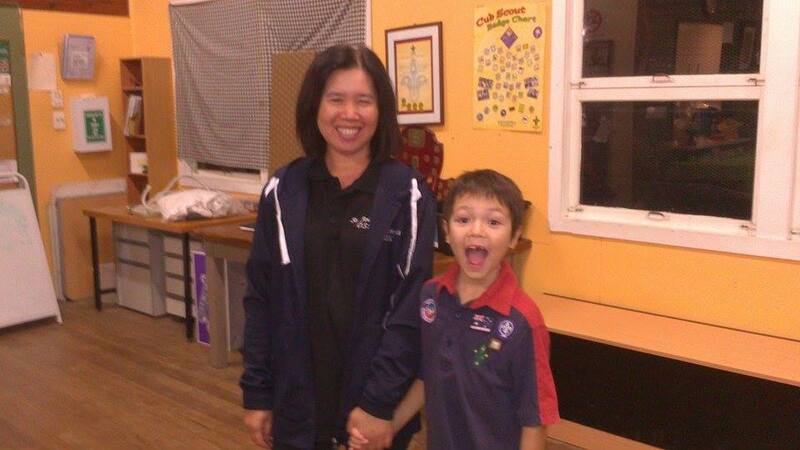 We also held a very special linking and investiture ceremony for two new scouts, Adam and Austin, while we were there. 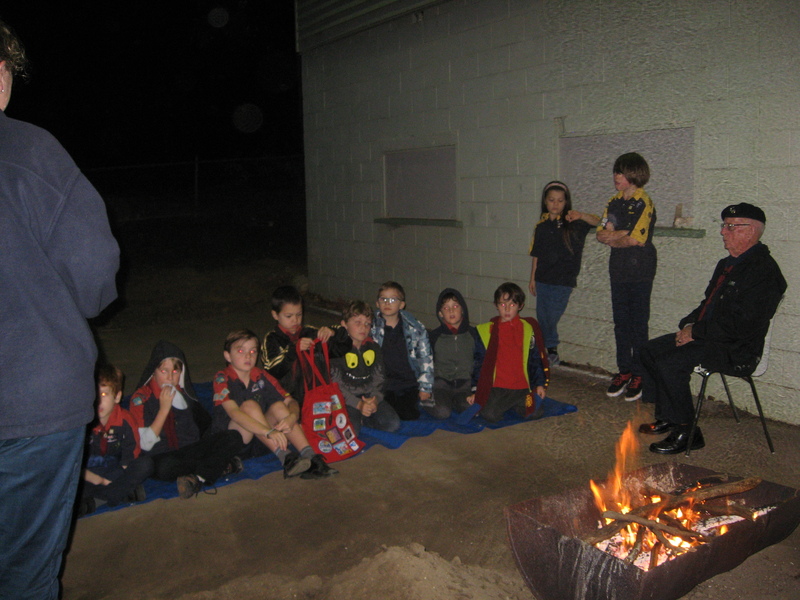 When we got back to the den we were very privileged to have Bill Whitestyles, our District Commissioner, pay us a visit and share some amazing stories with us about what he did during WWII in outback Australia for the war effort. We learned all sorts of things about transport trains and ambulance services, and really appreciate the time Bill took to spend with us. 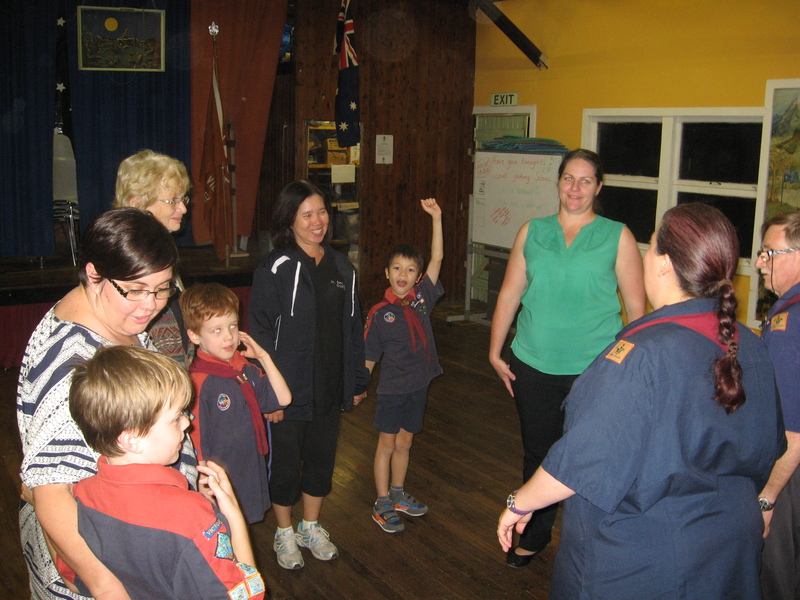 The scouts sat enthralled listening for well over an hour! 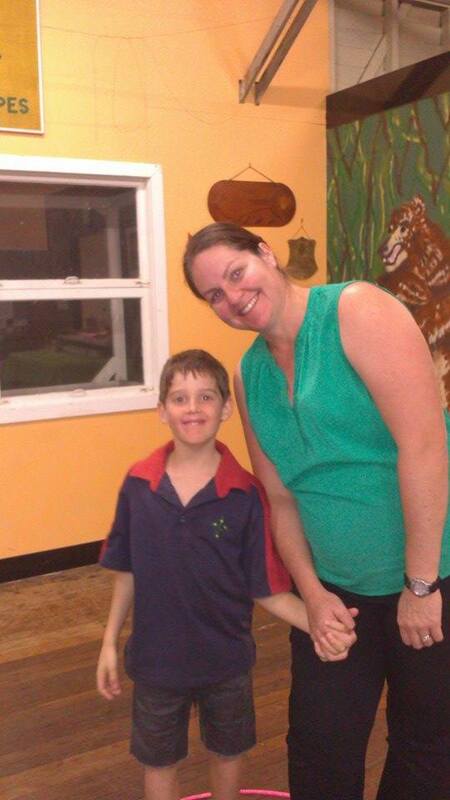 We also celebrated Adam’s birthday with fantastic pizza – thanks Moritz/O’Donnell family; it was yummy. 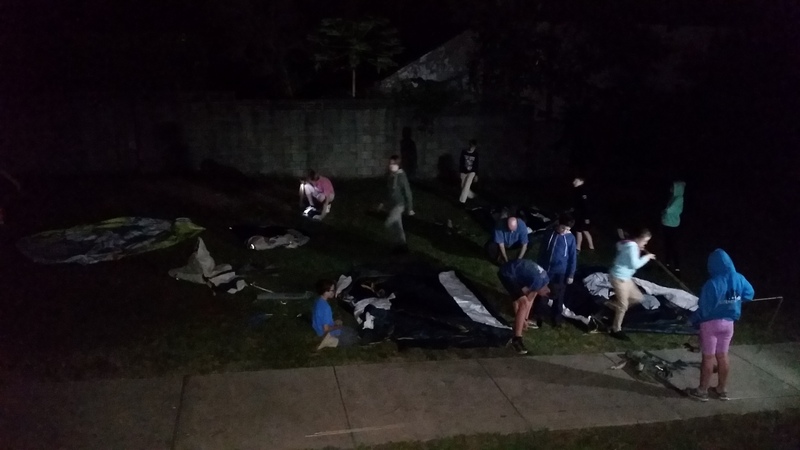 To end the night we pitched out tents on the easement and slept over, ready to be up bright and early for our ANZAC Day Activities. 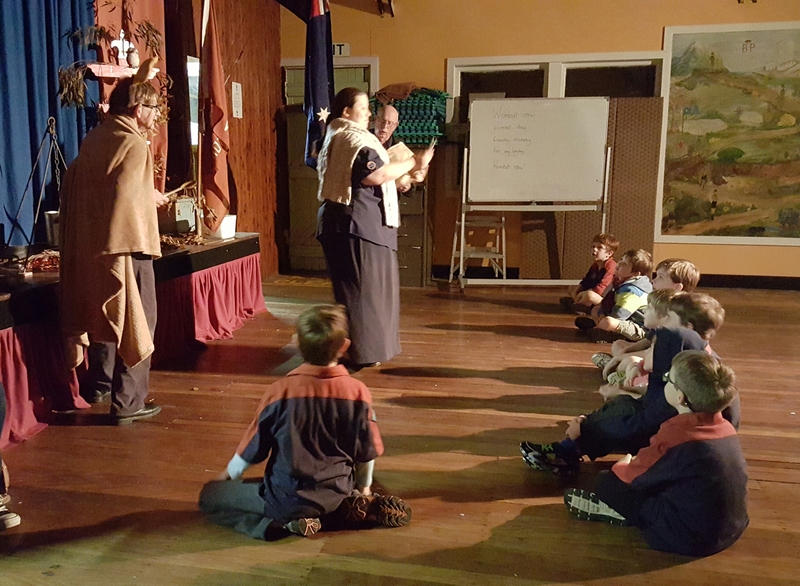 Being the 100th Anniversary of ANZAC Day, Echidna organised a range of activities that all of us were able to participate in, depending on our other commitments to school and bands etc. 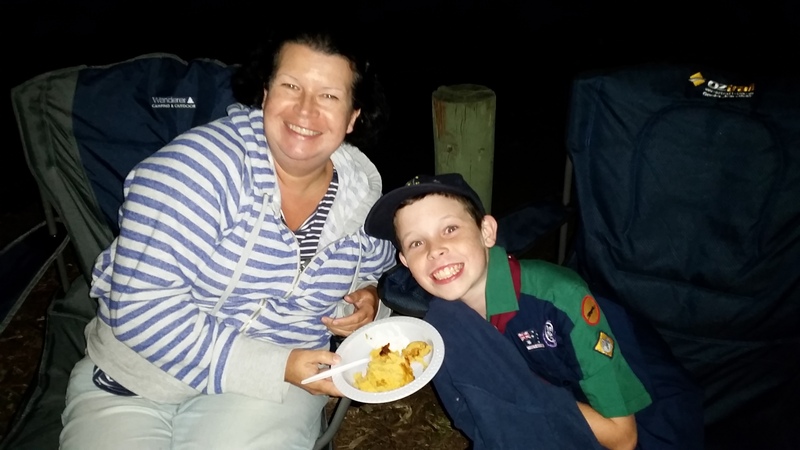 We started up very early with ANZAC biscuits for brekkie before headed off to the Greenslopes Hospital for the Dawn service. Most of us had never been to a dawn service before so this was very special watching the sun rise over Whites Hill as we remembered the fallen and the returned. 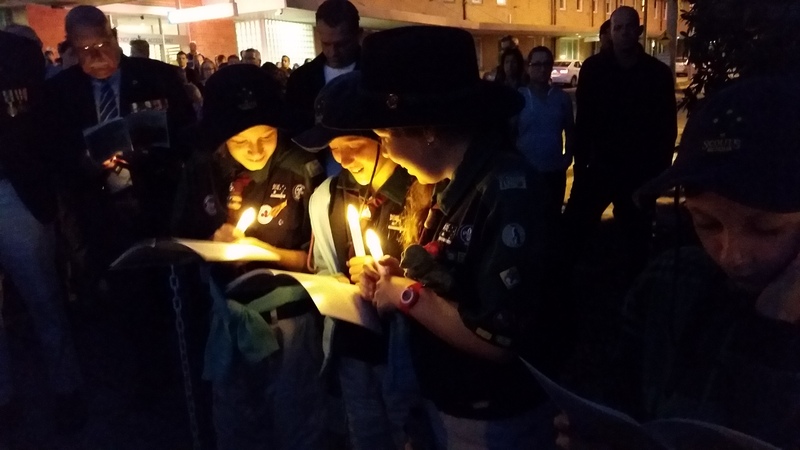 Then it was off to participate in the local Holland Park march (or to join in our various school parades) followed by a service at the Holland Park RSL. We were very thankful for our parents who ran the BBQ breakfast for the morning after the service and so was the community. BRAVO mums & dads for an awesome effort. Later a smaller group of us headed into the Brisbane City Parade. This is a very special opportunity where some scouts were able to carry banners and paddles to help identify different battalions. 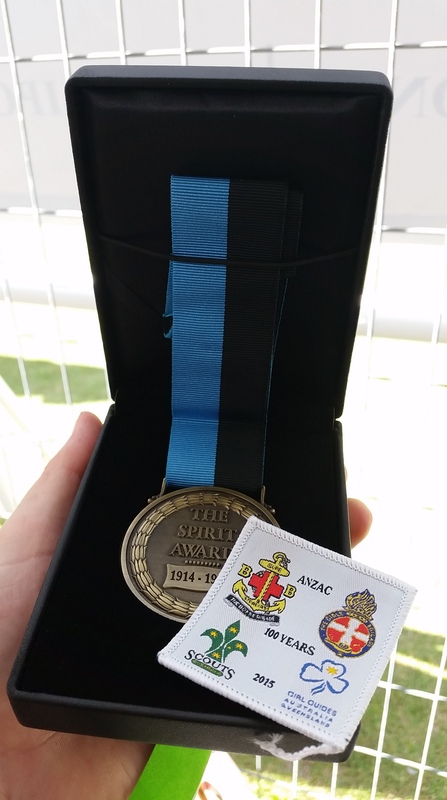 Those who participated received a commemorative medal and blanket badge. 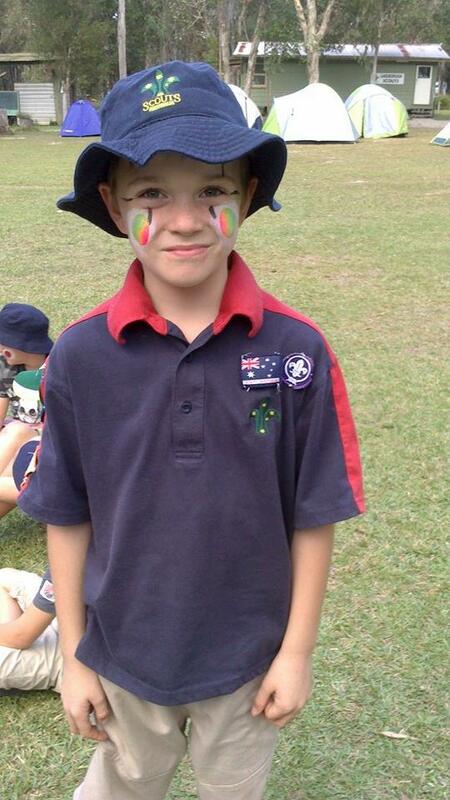 We then all marched as Qld Scouts at the end of the parade. 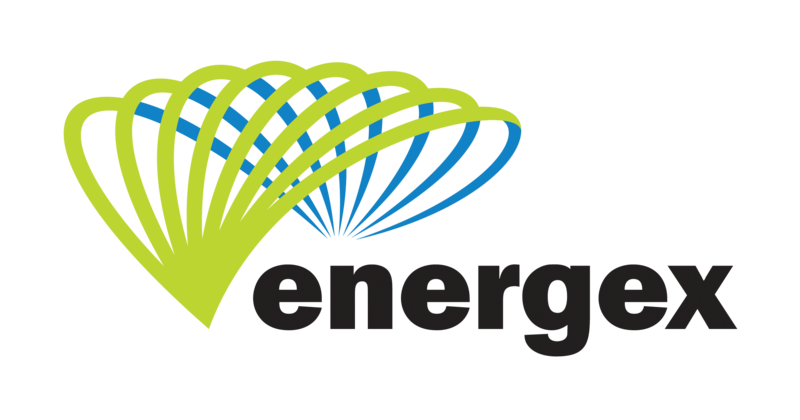 (Some of us even managed to do some badge work in the in between times – there’s a great example of making the most of leader downtime)! 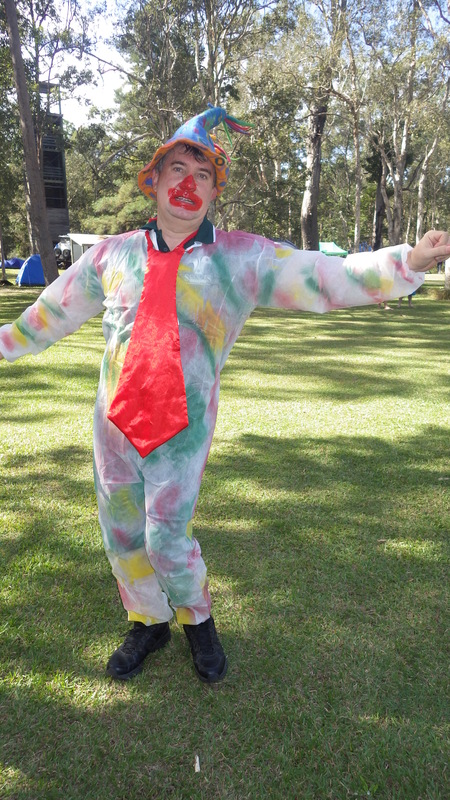 Unfortunately, due to the severe weather event and flash flooding that closed many roads and caused major damage across SE Qld, we had to cancel this camp. 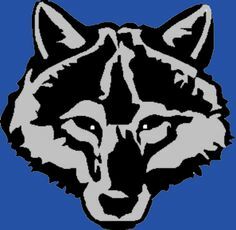 It will be reschedule to later in the year. 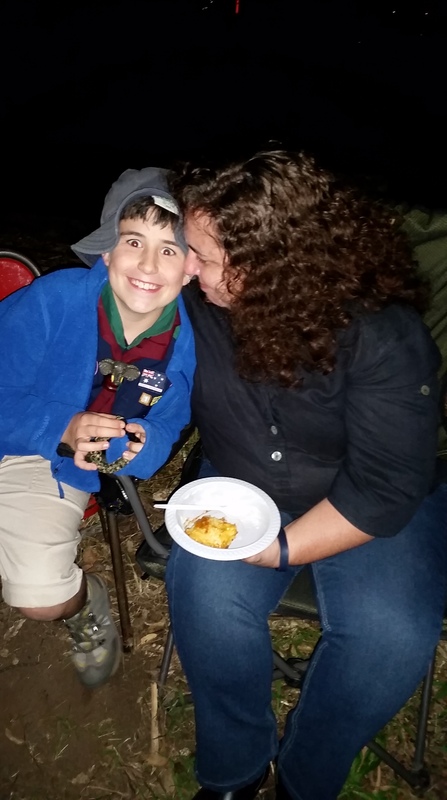 We invited all the mums to come along and share some special time around the campfire with their scouts. There were lots of songs, jokes and skits. 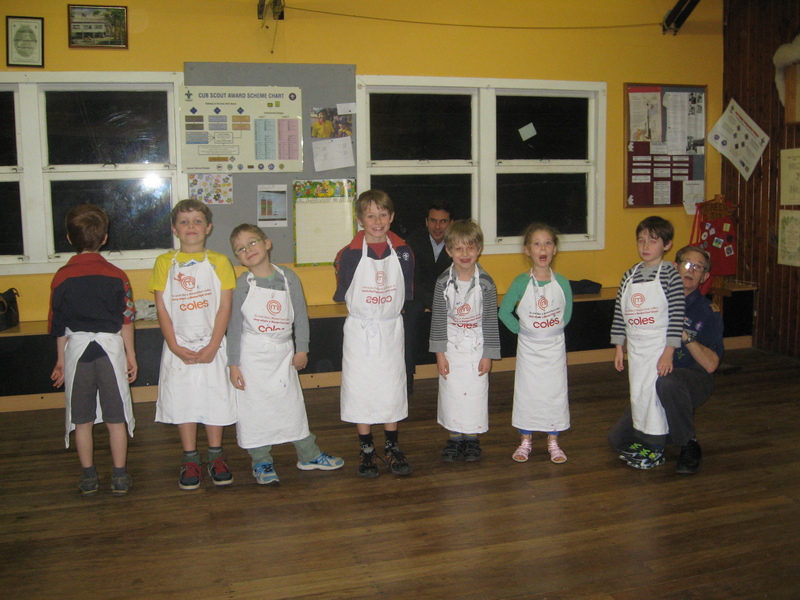 Panther Patrol did a fantastic job of making very yummy golden syrup dumplings for supper too! 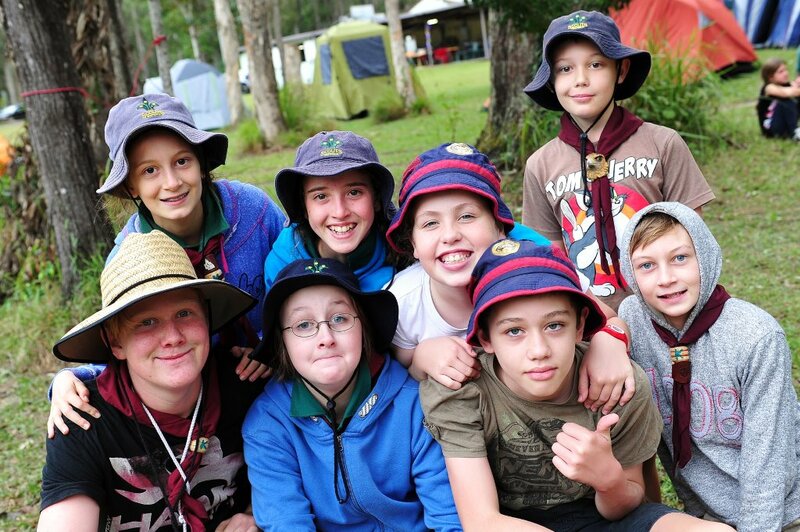 Two patrols (Penguin and Panther/Koala) joined forces to attend the Scout Construction Camp at Rocky Creek. 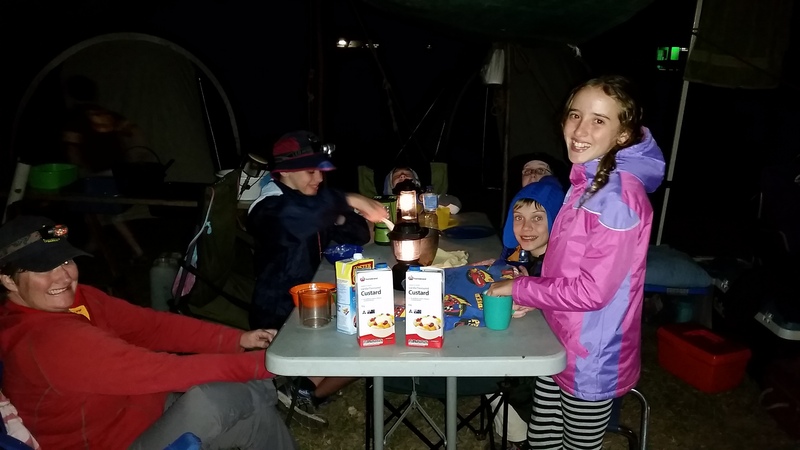 Most of us headed up on Friday night to get that extra night under canvas; towards Jamboree for some of us, or to just have fun making the most of camping opportunities. On Saturday our programme involved splitting into two groups. Patrol leaders spent some time learning how to cook hay boxes and to create various anchorage systems to support larger constructions. 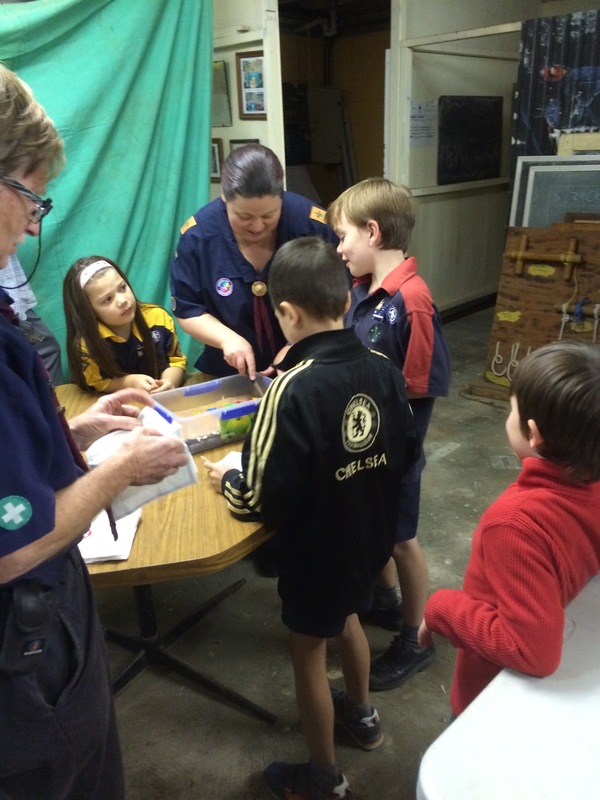 APLs lead their patrols off on a navigation challenge through the bush to locate a set of beacons. 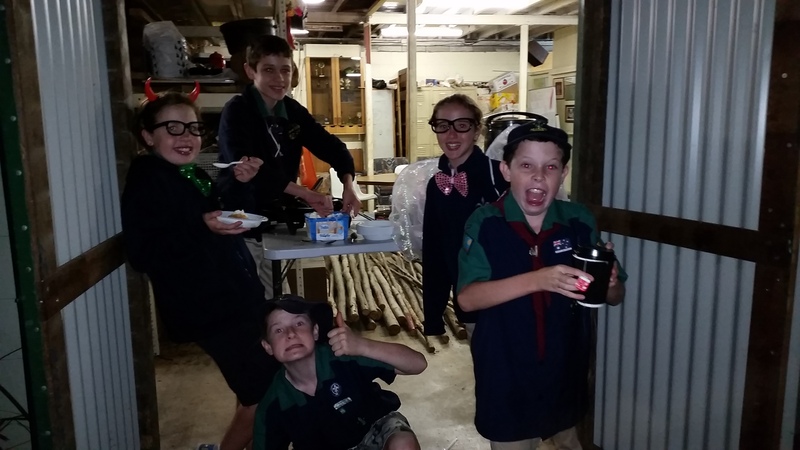 After this the patrols worked together to create their own hay box dinners. The afternoon was spent making big construction items. 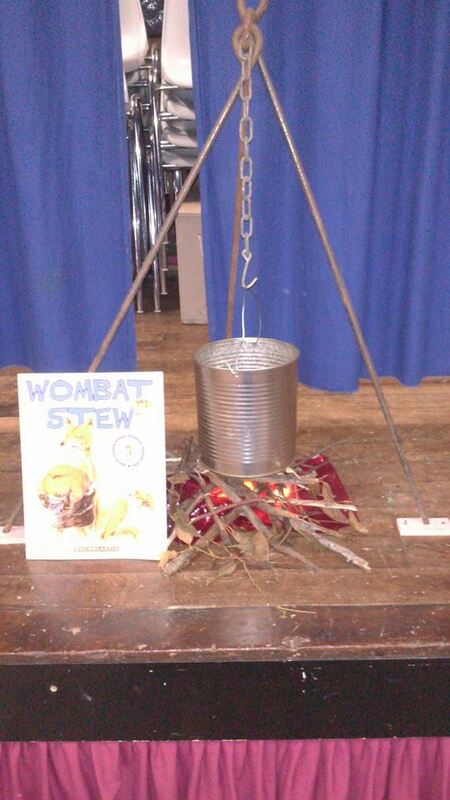 Often these take a couple of hours to make, which is difficult to do on a normal den night. 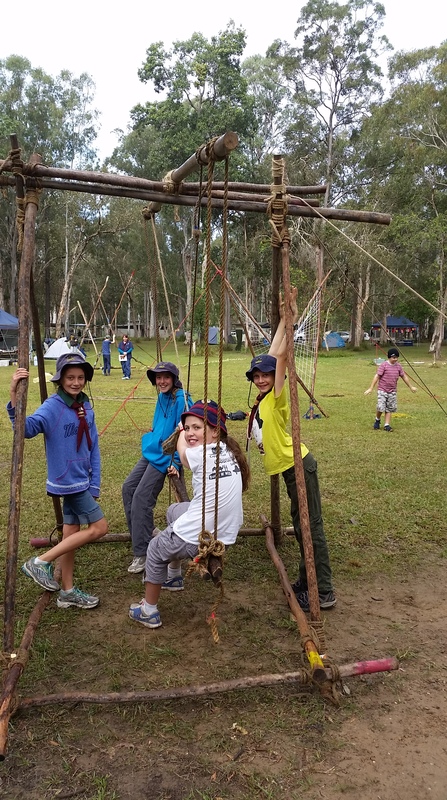 Victor scouts created one of the most popular items – a complex swing structure. Always up for a challenge this design was one that we had never made before. The two patrols worked together with the assistance of Komodo and Echidna (and a few others at various points) to assemble it. Each group made a different item. 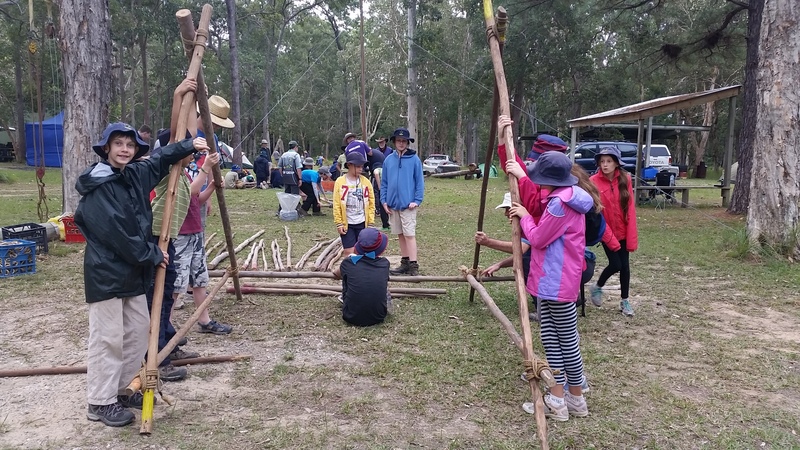 Wishart-Chester made an amazing whirly-gig and pully system, Tarragindi did a fabulous job to construct a hyperbolic-parabolic gateway, Rochedale made a very cool monkey bridge. Having made them all, we had a quick afternoon tea, and then spent the remainder of the afternoon playing on everything. It was really great that we could then just serve up dinner ready to eat as we were all tired from our construction efforts. Both patrols hosted leaders from other troops to dinner, with a chicken risotto and beef stew going down well for all. 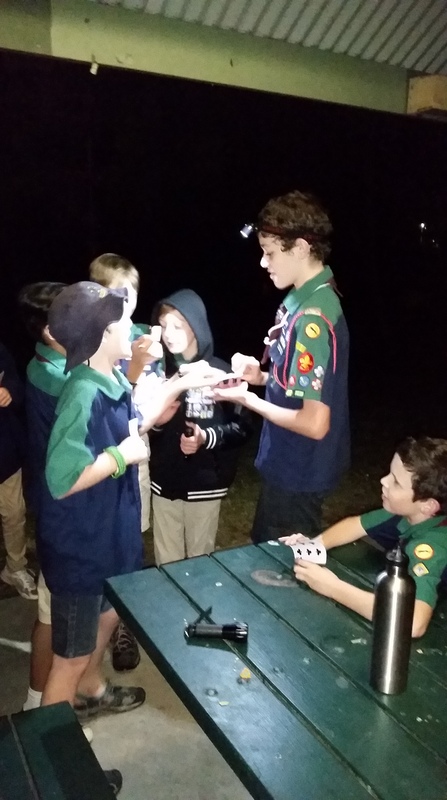 Unfortunately, storms passing over meant that campfire had to be cancelled but those of us not too tired were able to play a fantastic wide game called Funny Money. 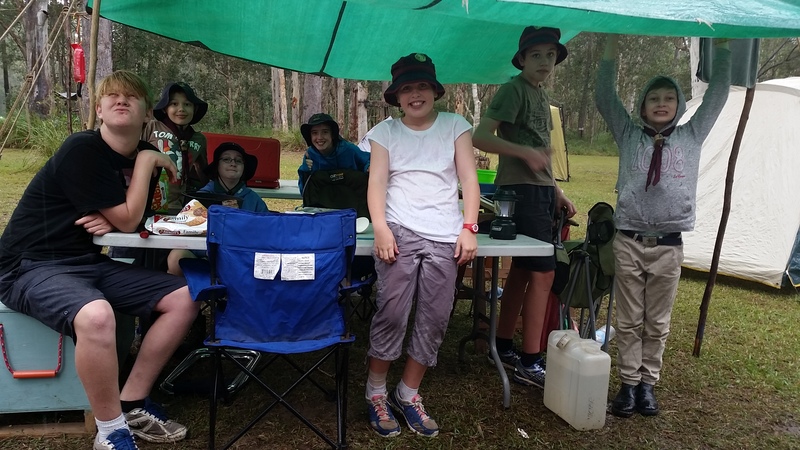 On Sunday we cooked up a yummy breakfast and then headed over to the campfire area to appreciate Wombat’s fire construction (even though we didn’t light it). 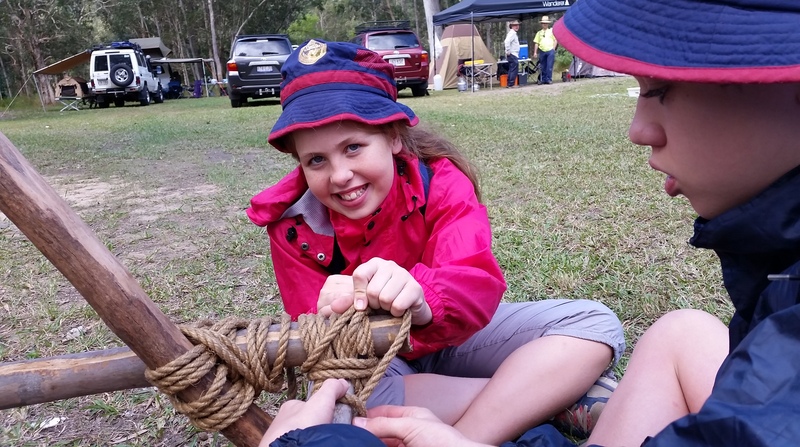 All our scouts were involved in the Scout’s Own held there. For those of you who don’t know what a Scout’s Own is, it is a time of reflection and of giving thanks for opportunities experienced. Elliot and Joseph helped prepare and lead the Scout’s Own, with Explorer level scouts assisting and Pioneer level scouts participating in the shared reflection of what they liked best about camp. Then it was time for trying to pack down all the construction items and our camp sites in between the sporadic downpours. 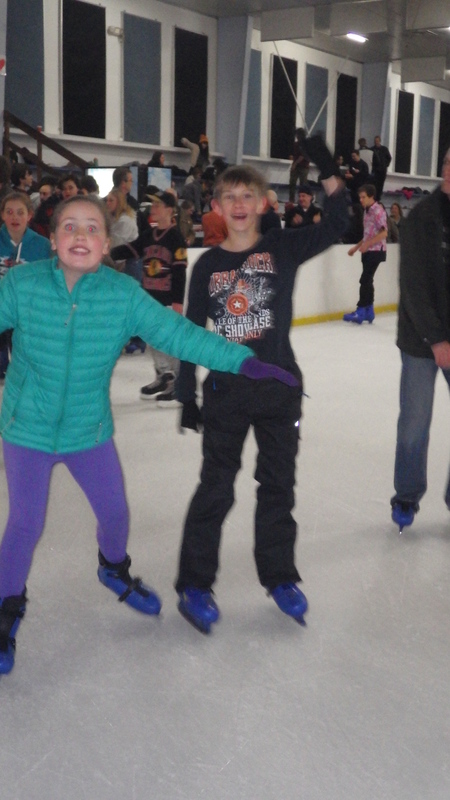 All up: everyone had a great time and learnt something new. We are spending some evenings this term preparing and planning for a Pioneer Hike. 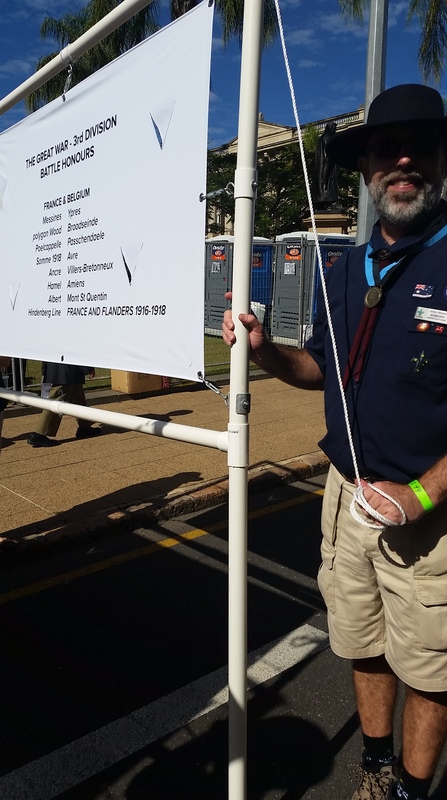 This is the last activity quite a few of our scouts need to earn their Pioneer Cord. This is an opportunity to plan things like: where we are going? ; what we need to pack? ; and what we might eat and wear on a hike? Each term we are going to try and schedule a night dedicated to getting through award scheme work. With so many active and engaged scouts there often isn’t enough time each week to get through everything people have been working on. We also filled out lots of proficiency badge planning forms and practiced, or learned, different knots and first aid information. 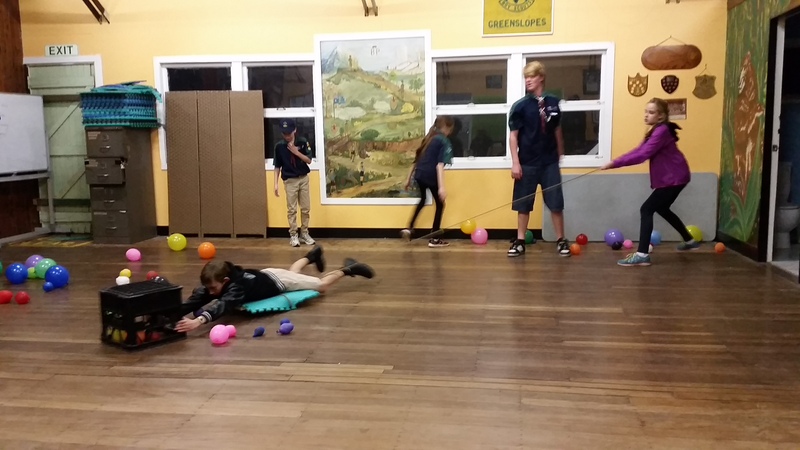 Best of all is that Raven (our new District Commissioner) dropped by and taught us a new version of dodgeball and an awesome game called Duster Buster that even our injured scouts and leaders could still join in! Thanks Raven! We’re also getting really good as working as a team in Hungry Hippos even though this is only the second time we’ve played. 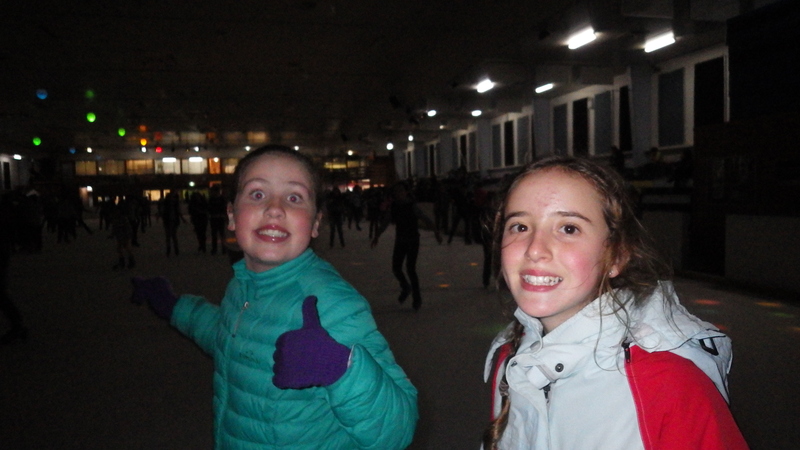 Some of us (those who had finished assessment for school already and didn’t have any other activities on) were lucky enough to be able to attend the annual District Ice Skating event at Ice World. 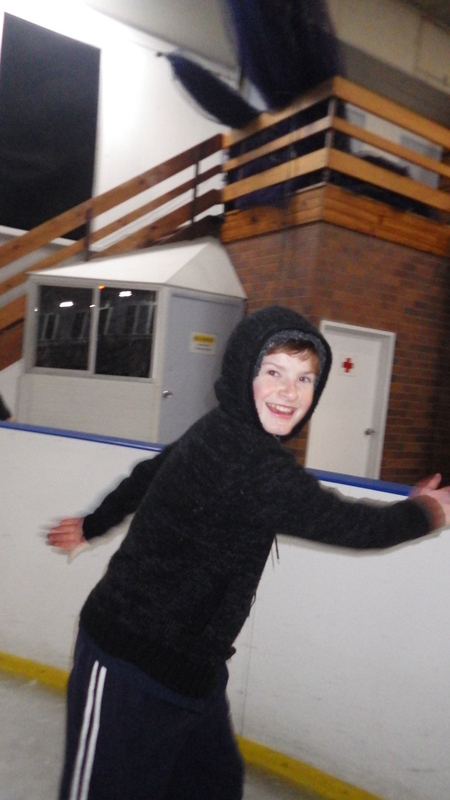 It was cold to start with but we had a lot of fun zipping around on the rink. Thanks Raven for organising it. 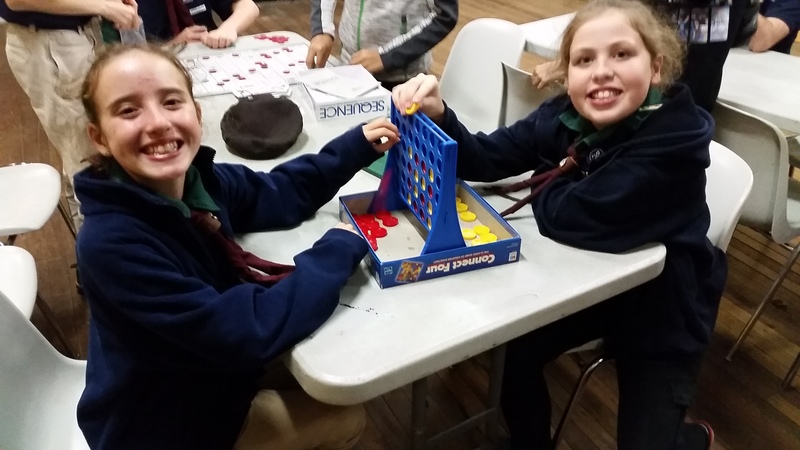 To finish off the busy term our last night involved spending time having fun together. 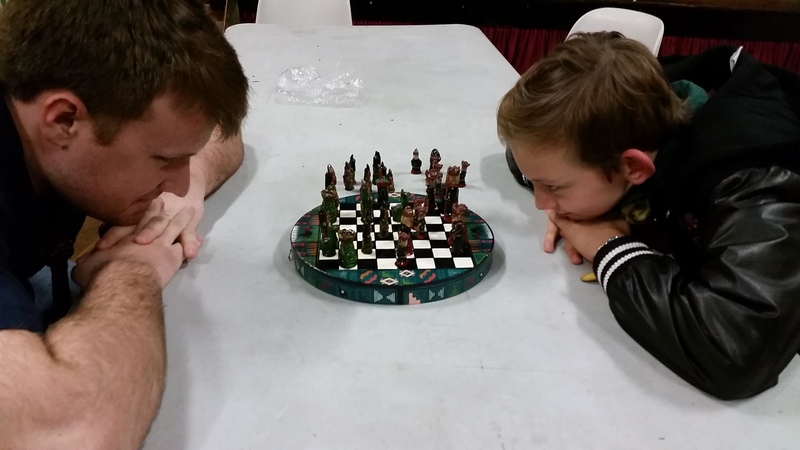 We played lots of different board games such as Connect Four, Chess and Sequence. 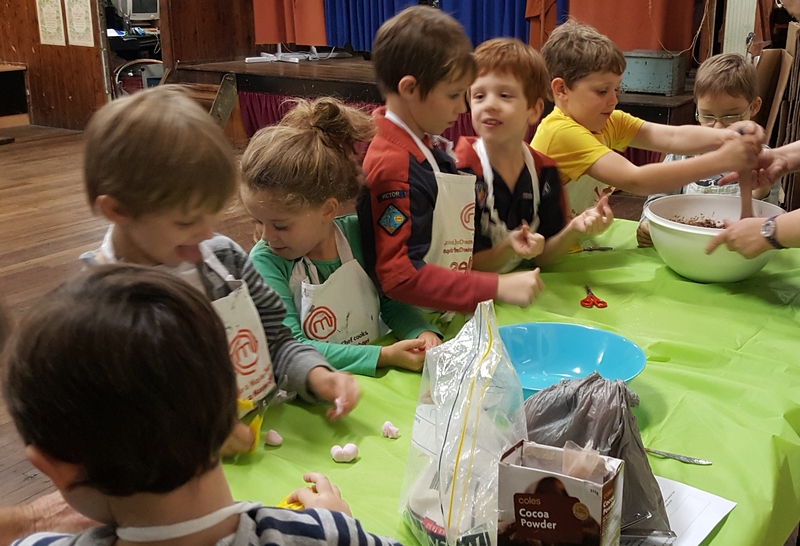 In between games a few of us finished off badge work activities and we all made really yummy pizzas in the brand new kitchen and oven. 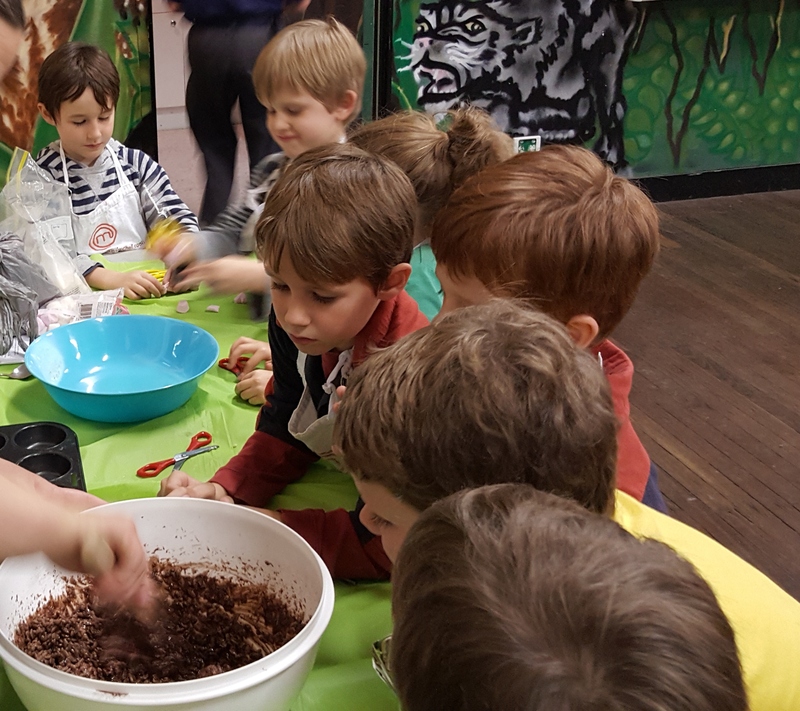 Thanks so much to the hard work by committee to provide this fantastic resource for us to learn about cooking and food preparation/hygiene. 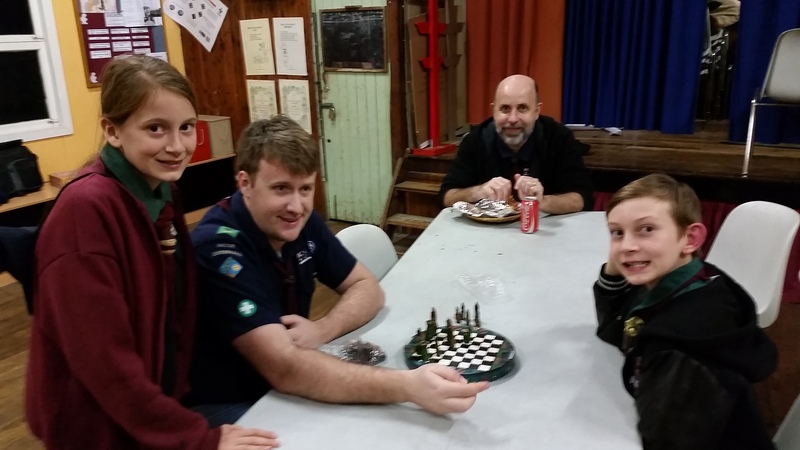 Troop council also worked hard by approving a total of 11 proficiency badge applications ready for scouts to fill their holiday downtime with lots of fun activities! 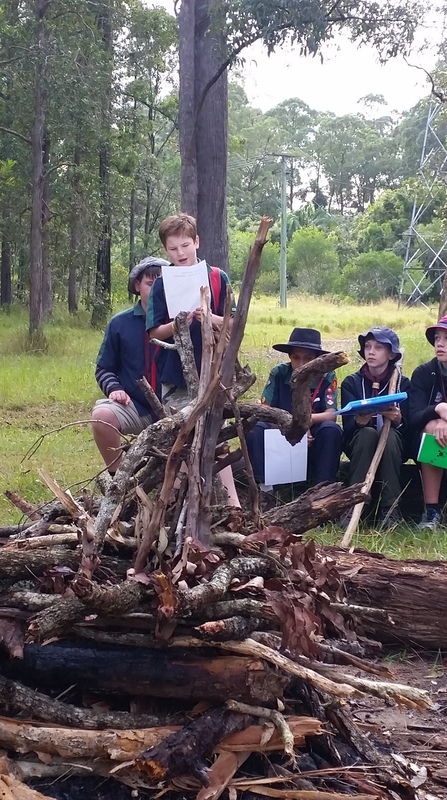 All our planning and preparation this term culminated in a group of scouts leading and completing a Pioneer Journey. 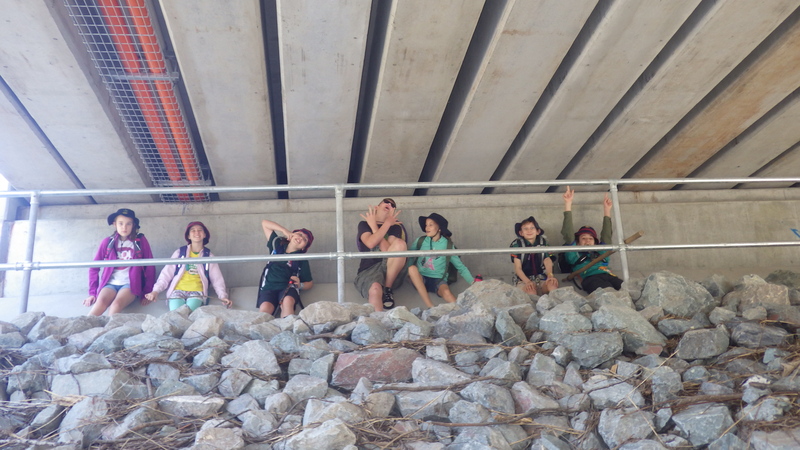 We started at Boorabbin Parklands in Wishart and followed along the Bulimba Creek biketrack and walkways all the way through to Minnippi Parklands in Tingalpa. Along the way we stopped at almost every single playground for some alternate activities. 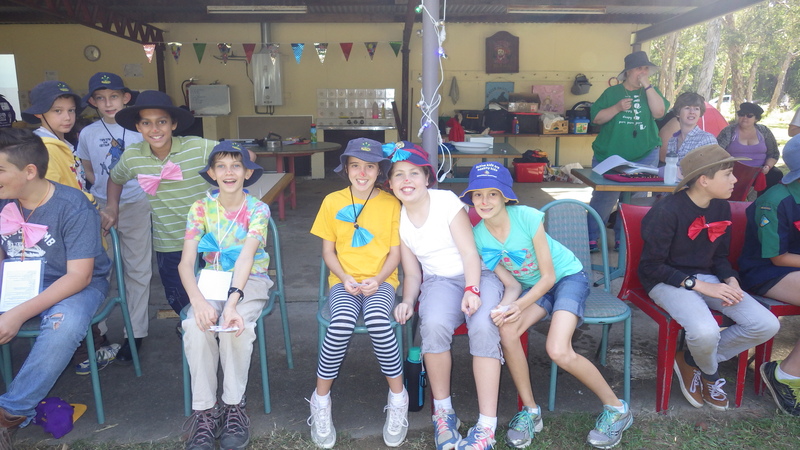 We had lunch at the Cadogen St Park where many of us cooked up hot lunches to practice our campcraft skills. On completion of the hike we had a very special parade on the water platform of the lake at Minnippi. 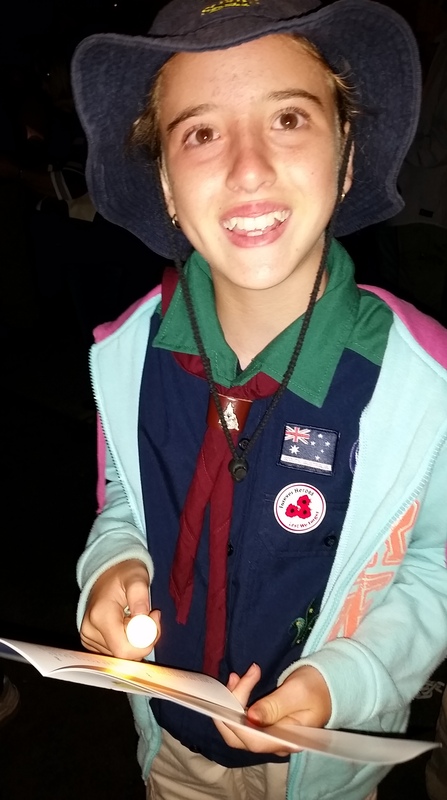 Four of our scouts (Alex, Tash, Livi and Laura) had earned their Pioneer Campcraft and Pioneer Badges by finishing the hike. In addition, Alex, Tash and Livi also earned their Pioneer Cords! 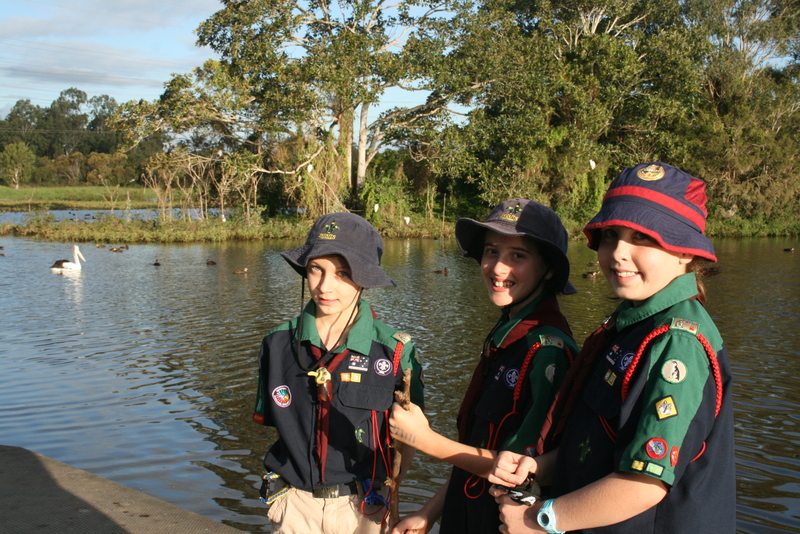 BRAVO to the three of you – you are all set to go to Jamboree now. Thank you to Komodo, Falcon, Hawkeye, Echidna and Garlanja for all your assistance today. A special thank you to Raven who came down to the park to help celebrate these achievements and present some of the badges. The kids really love and appreciate having such an engaged group of leaders and District Commissioner!